Got a big collection of keys giving you a big headache? Take one stainless steel BigRing to keep them organized, secure, and at hand, and call us in the morning. *Made of a continuous loop of sturdy stainless steel, the BigRing is perfect for those of us with more than the average number of keys. 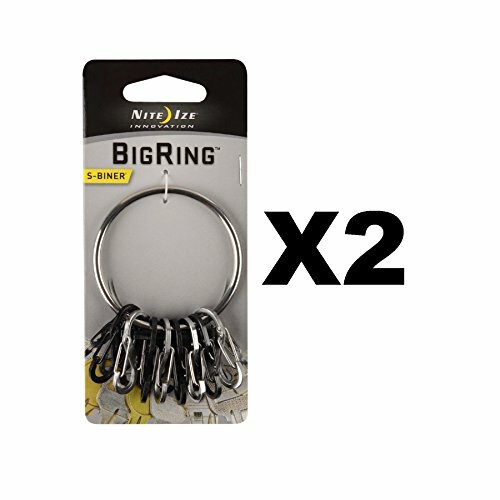 Large and roomy, yet lightweight and easy to carry, the BigRing comes with 8 #.5-sized Stainless Steel S-Biners in two colors (4 stainless, 4 black) so you can easily identify keys at a glance. Or, use one of the S-Biners to attach the BigRing to a belt loop, purse strap, or zipper pull, or to hook to a second ring. The S-Biners remove and reattach quickly and securely, making it easy to share keys with co-workers, valets, babysitters, or for taking a single key with you when you're out for a run or ride. More S-Biners can be ordered separately; the BigRing can hold plenty of them. The BigRing combines the innovation and versatility of the S-Biner to provide unique functionality and access to your keys. 2 different color S-Biners allow for easy identification of similar style keys - no more guessing!